*Disclaimer* I am not a doctor, registered dietitian, or nutritionist. My goal is to share personal experiences with wild edibles and my research on their benefits. Please do your own research and speak with your family doctor before taking anything for health improvement. Nature is full of bounty, and you can utilize many of its native edibles, some could be in your own backyard. Foraging for wild edibles is a great practise to master for your own enjoyment, or to begin a life of living off the land. Ontario has numerous wild edibles, some native and some not. Many of these foraged items can have a great impact on your health, from both consumption and the act of being outside foraging (see Chloe’s blog on The Many Benefits of Nature). Below I will be discussing some of the native wild edibles of Ontario and their benefits, where to find them, how to identify them, and how to forage and prepare them. Fiddleheads are the young unfurled fronds of a fern, named after the fiddle due to its similar appearance when young and curled. The Ostrich Fern is a somewhat large fern, native to temperate regions of the Northern Hemisphere. The Ostrich Fern is the only known fern to be safely consumed; all other ferns could have carcinogenic compounds and should not be eaten. Ostrich Ferns will generally be found in moist to wet shaded areas, preferring rich organic soils. They are often found near wild leeks and Ontario trilliums. Most ferns will produce fiddleheads, so being able to identify the Ostrich Fern is important to picking the right one. The fiddleheads will emerge between April and May, sometimes later depending on weather conditions. The coiled ferns are about 1 inch in diameter, with a brown papery film over the fiddlehead with a smooth stem. The biggest indicator that the fern is an ostrich fern will be a deep U shape in the stem. Once you have identified the fiddlehead, use a small pair of sheers or a paring knife to cut the fiddlehead off at the base of the curl, leaving as little stem as possible on the fiddlehead. Make sure you only remove about 10% of each cluster you find to ensure that the plant will continue to produce more year after year. The preparation of fiddleheads should be followed properly to ensure they are safe to eat. Due to the nature of their shape and how low to the ground they are, they can hold certain bacteria, so should be washed thoroughly. First thing to be done is remove the scaly film on the outside, by either brushing it off or picking it off. 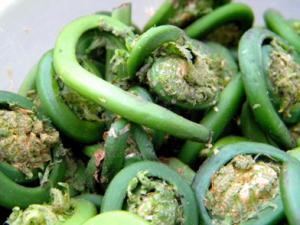 After the film has been removed, the fiddleheads should be rinsed several times with cold water. Once they have been rinsed, the government of Canada recommends boiling for 15 minutes, or steaming for 10-12 minutes to ensure they have been properly cooked. After these steps have been followed, the fiddleheads could be sautéed in garlic butter with other veggies, added to a soup, or added to an omelette. There are a variety of recipes you can follow to enjoy your foraged fiddleheads. Fiddleheads are full of nutrients for body. It is a great vegetarian source of Omega-3 fatty acids, which is essential for brain development and performance, and has anti-inflammatory properties, which can help with heart disease, joint pain, and autoimmune diseases (all have been linked to inflammatory issues). Fiddleheads are also high in vitamin A and C. Vitamin A an essential vitamin needed for healthy skin, hair, and nails, as well as for improved vision. Lastly, it is a great source for essential minerals and electrolytes such as iron, copper, potassium, and manganese. 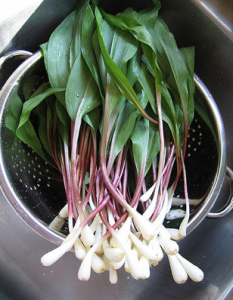 Ramps are a member of the onion and garlic family. They are usually found in deciduous forests with moist, rich soiled areas with partial to full shade. Ramps are quite easy to identify, they will have 2-3 long, smooth, lance shaped green leaves that have a purple to reddish stem. The leaves are thin and translucent in the light. When picking wild leeks, look for the poisonous look alike, Lilly of the Valley. Lilly of the Valley leaves will swirl from the stem, unlike the ramp, as well it will usually (but not always) have white bell shaped flowers. The stem of the lily will be white, unlike the reddish stem of the ramp and will not have the garlic/onion smell. This is the important part about leeks. When cultivating you must take special care to ensure the continued growth of the patch. Wild leeks take upwards of 7 years to reach its full life cycle. The wild leek needs two full years of hot and cold weather to be able to germinate and then start to produce leaves. Between 5-7 years the wild leek with reach its maturity, and hopefully it will start to produce seedpods. Now that you understand how long it takes wild leeks to grow and become the delicious spring food we love, here are some tips to help you properly forage for them. 1. Do not over pick the patch. When you find a patch of wild leeks, do not take more than 5% of it. This will help the group of leeks continue to grow without diminishing completely. 2. You may not enjoy this, but you can just take the leafs and leave the bulb to continue to grow so a new plant does not have to start over. The leaves have a milder flavour than the bulb and are delicious sautéed or added to a salad. 3. Alternatively, you can dig around the bulb, cut it above the root, and take everything above, leaving the rest of the root system intact. Now to the fun part. Wild leeks have a mild onion/garlic flavour, a little too pungent to eat raw, but some people like that. Once you have brought them home you should wash them thoroughly and pull off the thin film on the outside of the leek, similar to what you would find in between onion peels. Wild leeks can be used any way that onions and garlic are used, but my favourite is pickled wild leeks. Here is a simple recipe you can follow https://www.fromachefskitchen.com/pickled-ramps/. As wild leeks are part of the onion family, they many of the same benefits. Wild leeks are full of essential vitamins and minerals such as iron, choline, and folate. Iron is critical for proper transport of oxygen through the body, without adequate iron supplies you can be at risk for anemia, resulting in low oxygen flow in the body leaving. Choline is an important macronutrient needed for proper liver function, brain development, nerve function, and has many other benefits for your body. Folate is a B vitamin needed for your body to make DNA and produce new cells, which is why it is such an essential vitamin while pregnant to have proper fetal development. Jerusalem artichokes are part of the sunflower family and can be found in meadows and riparian edges. 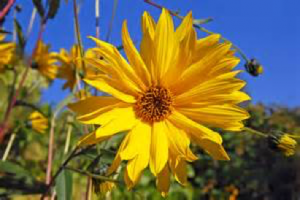 The Jerusalem artichoke is a tall (reaching 10 feet at times), thin plant with many leaves and flowers. The leaves of the plant have a texture of sandpaper and an ovate shape. The flowers are yellow with 10-20 petals, growing in clusters of 3-4. The flower is looks very similar to a black-eyed Susan, but without the large dark center of course. Now, the plant is not the edible part, but the tubers are. With a similar appearance to ginger or turmeric, the tubers grow under the ground acting as part of the root system. The flowers bloom in late August to September, and can be picked about 2 weeks after the flowers have faded, but the best time is after a few frosts. To pick them, dig up the roots and pull out the tubers. They can be harvested throughout the winter, any tubers left will sprout and grow again next spring. 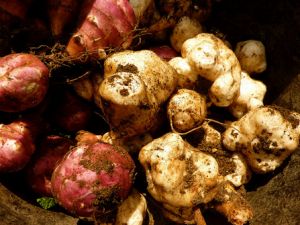 Sunchokes can be used in ways similar to potatoes, but can also be eaten raw, which is a favourite among many. Once you have gathered your Jerusalem artichokes, wash them thoroughly. They can be sliced up and salted, eaten like a cucumber, shredded on a salad, added to a soup, boiled and mashed, or roasted. The versatility of the Sunchoke is one its great assets. If you chose to cook them, be wary of the time as they can be over cooked easily. Jerusalem artichokes are full of vitamins and minerals, but one of the most interesting benefits is the inulin. Most starchy foods are full of carbohydrates, which are needed, but while digesting they are converted to sugars making it hard for diabetics. Sunchoke starches are in the form of inulin, which bypass the digestion process and go to the lower intestines and feed the good bacteria as a micro biotic. Being able to identify and forage for wild edibles can be a great skill for anyone to acquire, it takes time and practice, but you really can’t lose with this skill. There are many other wild edibles in Ontario for you to enjoy, but always remember to do your research and never eat something you aren’t 100% sure is edible. Now get outside and start searching! You never know what you could find.